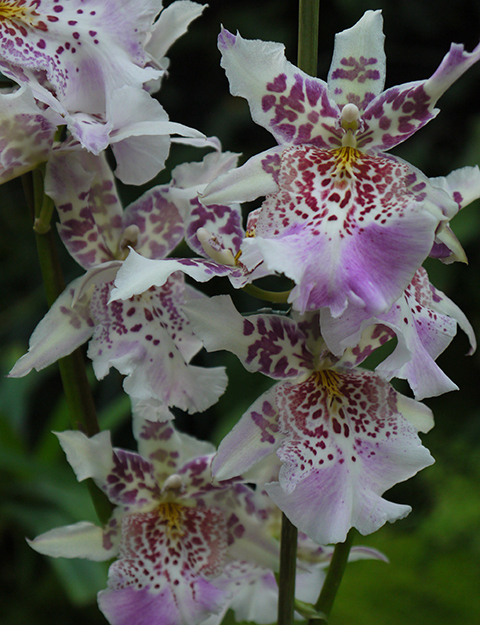 Among the Dancing Lady orchids, subtribe Oncidiinae, the Oncidium intergenerics are the ballet corps: beautiful, even fragile looking, but in fact, quite strong. Subtribe is one rung above genus on the taxonomic ladder. Genera within the (formerly) large genus Oncidium are closely enough related that hybridization is possible among them. 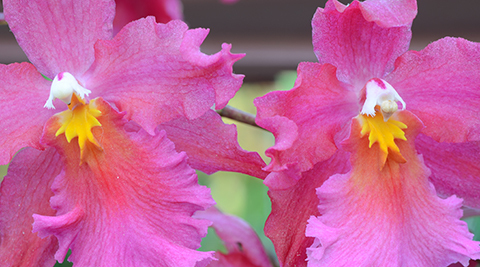 Beautiful but tough--that's the goal of all of the breeding involved in making one of these complicated hybrids. Want to buy one of those gorgeous high elevation Odontoglossum for your place in Atlanta? Why not just set your money on fire? Try a Beallara instead. 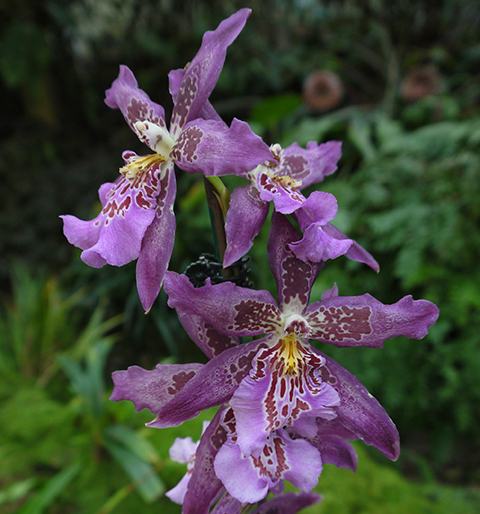 Beallara combines four genera. Odontoglossum and Cochlioda for frills plus Miltonia and Brassia for warmth tolerance. 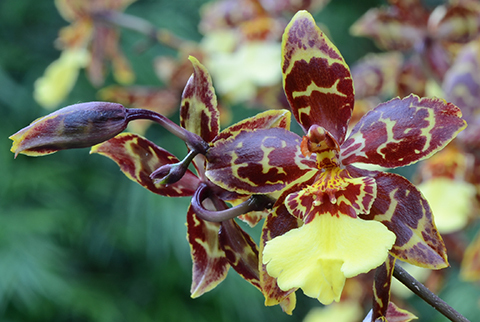 There are lots of different Oncidium intergenerics bred for beauty and ease of growing. A few hours of mild but direct morning sun on an east facing window sill will provide enough light intensity for flowering. Make sure there are no trees or buildings blocking the light. A west-facing exposure will work if you make sure the leaves don't feel hot to the touch. In a greenhouse, 50% shade. All orchids like a daily 15º difference between day and night temperatures. The annual temperature range should be between 58º low (at night in winter) and 83º high (daytime in summer). Take a good look at the potting mix every day for the next week and learn to recognize the change in color & moisture that accompanies the drying-out process. The top 1/2 inch of potting mix will be lighter in color and drier on day six than on day one. Drench thoroughly from above when that top 1/2" looks dry. Saucers that allow standing water to accumulate and flow back into drainage holes are a bad idea. You did pick a pot with drainage holes, right? Putting that pot inside another pot without drainage holes is cheating. Your plant will know. Your plant will know that you value waterstain-free furniture above its own life and it will die. 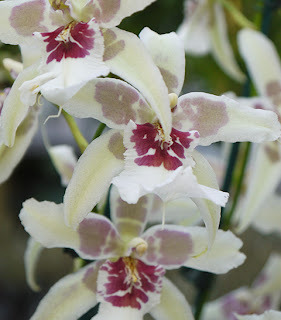 Oncidium intergenerics like to grow in relatively small pots in either a fir bark-based orchid mix (which you can buy from most garden centers) or a New Zealand sphagnum moss mixture (purchased online). 1/2 strength all purpose soluble fertilizer every two weeks.